After bungling Daylight Saving Time production and botching Sunday delivery to many customers, the Post-Standard in Syracuse, N.Y., and the less beloved syracuse.com bear little but negative portents for us in Cleveland. 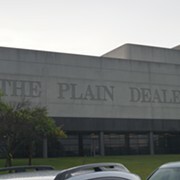 The Post-Standard, syracuse.com, The Plain Dealer and cleveland.com are all owned by the mostly misguided Newhouse family and Advance Publications/Advance Digital. Following this past weekend's blunders in Syracuse, readers vented their concerns over the post-layoffs, post-transition local media. The comments section of the website shows a lot of the same weary distaste that readers have come to know and hate in dealing with their local Advance outfit. In short, problems have escalated since the Post-Standard went to three-days-a-week publication and laid off large swaths of the newsroom. So much for the assurances that those subscribers that failed to get the full edition would receive it by today. They keep this up and they are headed for even more losses of readers and revenue. Syracuse Media Group President Tim Kennedy fired off a rather limp-wristed apology that mostly cites mechanical failure while doing nothing to point out solutions or legitimate "transitions" that may actually benefit the community. Kinda like when lame duck Publisher Terry Egger and Editor-in-Chief Debra Adams Simmons passed the company line along to readers and maintained little more than a good seat on the sidelines for any forthcoming fireworks. On Nov. 18 last year they wrote: "We do not have a specific plan, timeline or structure for Cleveland. But we will — very soon. We have opportunities to capitalize on the tremendous strengths of The Plain Dealer, Sun News and cleveland.com, which are all under the Advance umbrella." Not much has changed since. Employees at the PD and Sun News remain on pins and needles with naught but a few "Hey! How's it goin', guys?" visits from Egger. Cleveland.com, for its part, keeps on rolling out hip, new redesigns that further dilute editorial decision-making and any real sense of newsworthiness. Dig the live chat that .com leadership hosted last summer to get a feel for how users are taking the cookie-cutter changes that slowly but surely trickle down from Advance's top brass.